The 10 hand reflexology zones! The 10 hand reflexology zones. In order to understand the basics of hand reflexology properly it is important to become aware of the so-called 10 hand reflexology zones – see picture above. Even though 10 hand reflexology zones display various parallels with the nerve system, the so-called ‘dermatomes‘ and the meridians (which represent a concept in the Chinese Yin-Yang philosophy); however, the 10 hand reflexology zones represent a system on it’s own. This implicates that the 10 hand reflexology zones do not directly represent any specific system in the anatomy of the human body (this also applies for the 10 reflexology zones in foot reflexology). Hand Reflexology: about somatic reflex arcs & the central nervous system! The basic principle of hand reflexology can be understood via the so-called ‘reflex-arc’ – a phenomenon in the central nervous system where a body reflex response is induced by a stimulous without getting the brain involved. For example: if a finger gets burned by a candle, the painful stimulus will induce a rapid response: the finger is instantly removed from the flame with the jerking motion. At the same time the brain is receiving indicating that a painful event occured in the hand. It is important to understand that although the brain may perceive the painful stimulus (at the level of the skin), the ‘reflex arc’ acts to retract the hand without direct imput from the brain (see video above). Hand reflexology is based on a likewise reflex-principle affecting the inner organs (instead of muscle action); this is also known as an ‘autonomic reflex arc’. 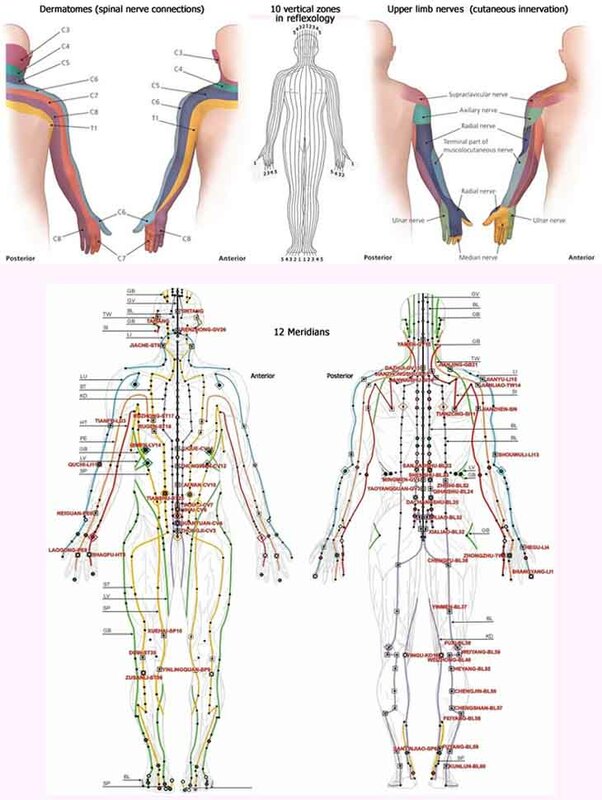 The 10 vertical reflexology zones, the meridians (which represent a concept from traditional Chinese medicine), and the so-called dermatomes, provide some clues about how the reflexes tend to work inside the body. The picture below describes the primary heart channel and the primary lung channel. 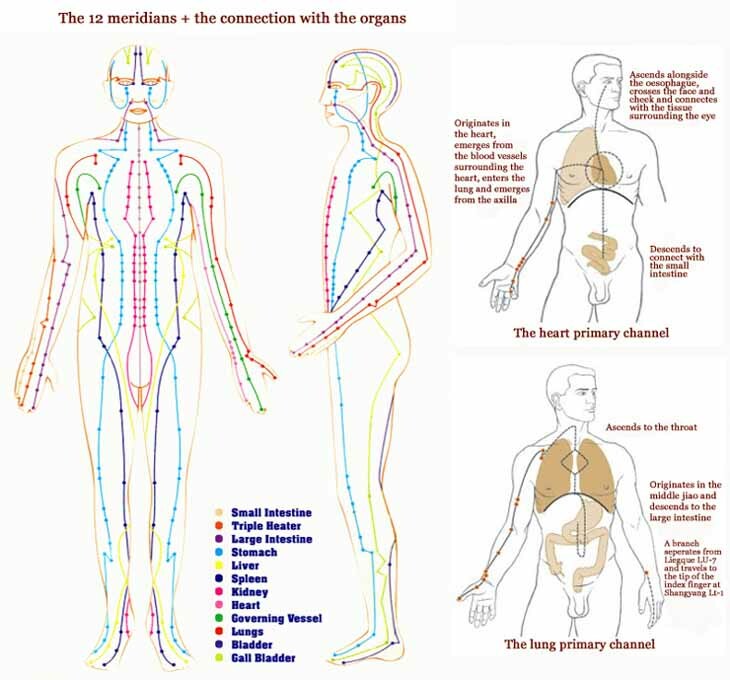 The primary heart channel and the primary lung channel: the 10 vertical reflexology zones, the meridians, and the so-called dermatomes show how the reflexes tend to work inside the body in hand reflexology. Hand reflexology technology (2): the C|Max AcuPalm! The C|Max AcuPalm provides the user a 10 minute hand reflexology session; according the developer of the product the C|Max AcuPalm can give the user “daylong energy to meet the tasks”. 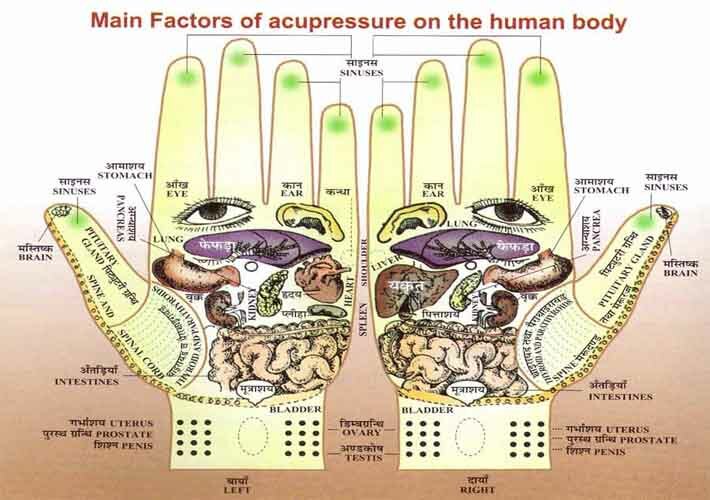 The C|Max AcuPalm addresses acupoints in the palm and fingers – which are assumed to be connected with the viscera, meridians, vital force of the human body. The C|Max AcuPalm device can help in balancing the ‘Ying and Yang’ (positive and negative energies of the body) through immediate meridian regulation. Also, regular usage of the C|Max AcuPalm is said to energize the body organs- and systems, which should assist to avoid various health ailments. The producer of the device claims that the C|Max AcuPalm can be used by anyone and everyone. But as a he hand reflexology massage device it may be especially usfull for housewives, children, office-goers, businessmen, office professionals, creative people, sportmen and all who are health enthusiasts. Regular usage is also recommended to IT professionals and people whose work is especially through fingers or hands. This automated hand reflexology machine proves to be a one-in-all solution! Hand reflexology technology (1): the Breo IPalm520 Hand Massager! Technology has entered the field of hand reflexology. One of the latest innovaties is the Breo iPalm520 Hand Massager – which is part of the Breo massager product line. The Breo iPalm520 Hand Massager is based on infrared heat compression technology and concerns the very first of its kind. The Breo iPalm520 massages the full hand bringing a meridian massage experience to the user. Hand reflexology: introduction in a nutshell! Hand reflexology is similar foot reflexology. Reflexologists believe there are pressure points in the hands, feet & ears that correspond with certain organs of the body. While foot reflexology is much more well-known (google trends foot reflexology is about 5x more popular), the benefits of hand reflexology are obvious: the hands are far more easy accessible for a massage! Because the fundamentals in hand reflexology and foot reflexology are similar, one can find stricking parallels between hand charts & foot charts. In this blog I will explore the fundamentals of hand reflexology & hand acupressure via various approaches, including a comparison of various hand reflexology charts. But interesting reports & products – such as the C|Max AcuPalm (see picture below) & the IP-520 Hand Reflexology Massager – will be introduced here as well. And of course, the reflexology top storier will featured as well. More details about the fundamentals of hand reflexology is available at: Hand Reflexology Charts. Enjoy the reading & your suggestions are welcome!